Formed by Vaarwel in 2005, Frozen Ocean started as an atmospheric black metal act. Not content to stick to one style, the past decade has show the band moving through several different genres, yet managing to retain a stylistic feel that is their own. Frozen Ocean has been through a trilogy of rather raw black metal albums, Vanviddsang, Likegyldig raseri and Natt over meg, the droning ambiance of Aokigahara and Oneiric in Geocentricism and the electronic Trollvinter, just to mention a few. 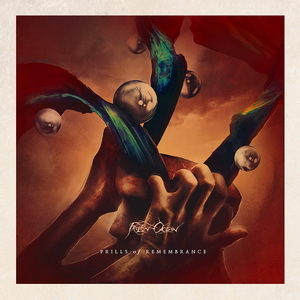 Hearing that old muse again, Vaarwel’s latest effort, Prills of Remembrance, shows the Russian multi-instrumentalist turning towards a new sound; trip hop/down-tempo soundscapes. According to Vaarwel, Prills of Remembrance was created “as pieces of soundtracks to some inner pictures” that he envisioned. Regardless of how that sounds, it’s actually quite an apt description for the forty minutes of introspective music on display. Each track breathes a life of its own, from the mellow pianos and mystical aura of “As White Supergiant Illumines Petrified Streets” to the astral ambiance of “Slow Stars in Underwater Caves”. The rather verbose track titles give an idea of what Vaarwel was imagining while writing this material and really allow you to sink into the soundscapes with ease. Trip hop rhythms and down-tempo electronics breeze through the speakers, never gaining more speed than a brisk walk; content to exist in the hazy mist. While each track takes a form of its own, the majority of the album presents a rather lush backdrop of ambient noise with simplistic percussion, electronic notes and whimsical keyboard passages. The album’s opener, “Touching Clouds Beyond the Edge of Dome”, is a quiet example of minimalistic keyboard notes and minor electronic touches to present a vivid yet calm passage while “Broken Feather of the Last Seraphim” uses slower paces and eerie keys for a more somber and ritualistic sound. The most striking passages of the album are those that incorporate piano passages, like “Gathering Amaranthine Rain of Escape” and “White Birds Thaw on Toy Soldier’s Burial”, evoking a sense of serenity and peaceful escape. Despite the lack of metal on this album, there is still plenty to dig into, especially if one is looking for a relaxing listen. A few segments really remind me of the old PC game Shivers (the ancient aliens room to be exact), which had a bit of a mystical aura sewn throughout, but then again this is meant to be a soundtrack of sorts. I’ll be honest, I haven’t ventured very far into the world of down-tempo or trip hop aside from Portishead or Massive Attack, but Frozen Ocean certainly has crafted an interesting listen for when a more relaxed sound is required. This entry was posted in Reviews, Unsigned Reviews and tagged ambient, atmospheric, atmospheric black metal, black metal, Down-tempo, Frozen Ocean, Prills of Remembrance, russia, Trip hop, Vaarwel.